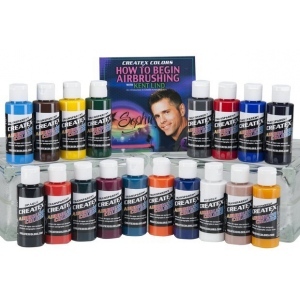 * Made with light-fast pigments durable resins and quality ingredients Createx works on fabric wood leather canvass plastics aluminum metals ceramic clay poster board brick plaster latex glass and more. 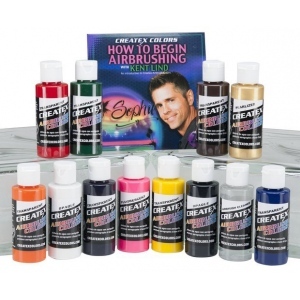 * "How to Begin Airbrushing" DVD is for the airbrush beginner and walks them through many of the challenges involved with learning how to airbrush from set-up of the air compressor cleaning and maintenance of the airbrush to the basics of paint type and operation of the airbrush. 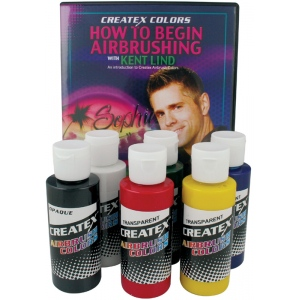 * Also includes "How to Begin Airbrushing" DVD.